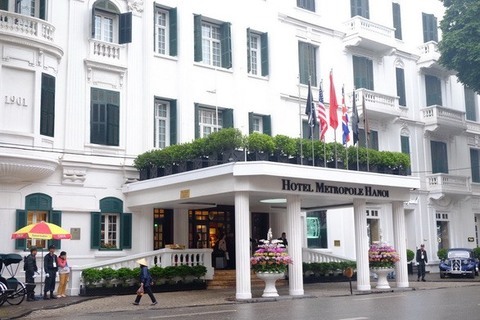 All 5-star luxury hotels in Ha Noi have run out of room ahead of the second DPRK-USA Summit, taking place today and tomorrow in the capital city. According to Bao Giao Thong (Transport) newspaper, most three-five star hotels in urban districts are booked up until the end of February. The major five-star hotels including the Hilton, Ha Noi Daewoo, Melia, Sheraton, InterContinental, De L’Opera, Apricot, Crowne Plaza West Hanoi, Sofitel Metropole and JW Marriott revealed they had no vacancies until March. “All of our rooms are occupied from now until the end of March. During the DPRK-USA Summit, the entourages following have booked to stay here. One group even booked more than 100 VIP rooms for before and after the event,” a representative of the Ha Noi Daewoo Hotel said. Korean Broadcasting System (KBS) selects a terrace of a high-rise hotel in the city to record the event. Ha Noi has nearly 3,550 tourist accommodation establishments (hotels, tourist apartments and hostels) with a total of 60,516 rooms. According to Price of Travel website, among the world’s 137 cheapest tourist cities ranked in January 2019, Viet Nam had three cities listed in the top 10. Of them, Ha Noi was named the cheapest for backpackers with an average cost of $18.29 per day, followed by HCM City at $19.47 and Hoi An at $21.2. Hoang Nhan Chinh, head of the Tourism Advisory Board, said Ha Noi was capable of hosting international events with morden facilities and professional services. International news agencies have gathered in the city for the summit. Hoan Kiem Lake, a symbol of Ha Noi, has appeared the most on TV.